Simply adds a swatter to the Basic Wildfire Kit to make fire fighter able to swat out fast moving grass fires. Universal Handle, Magnum Pulaski, Troop Tool and choice of Dragon Swatter or Tony Pad Swatter. We need one other tool head option for tough turf grass fires. Thick grass root systems or heavy organic mats prevent quick and easy scraping ground cover down to mineral. This prevents effecient fuel starvation tactics or line building. So, for fast moving grass fires, fire fighters revert to actually swatting and beating the flames out. This disrupts the combustion cycle. DRAGON SWATTERS snap-locked on to the Universal Handle to become 7.5’ long tools, that keeps backs straight, people comfortable, with faces out of the flames, (a hedge against dehydration). The Dragonslayers’ system is set up to have the fire fighter carry only one primary tool head, and one secondary tool head to any given wildfire ecosystem. So, if you are dealing primarily with grassfires you would have the Dragon Swatter, as your main tool; with a Pulaski head, (2.8 lbs.) being your secondary tool head. All Professional fire crews ought to be equipped with the Official, Universal U.S. Wildfire Tool Kit. They are then balanced and ready. Equipped to go anywhere to do effective work on any wildfire. The tool system itself is a teaching vehicle. Universal Handle. 2.1 lb. Hickory, 37 ins. long. This specially engineered wooden handle with snap-lock fitting, is longer and approximately twice the strength of a traditional Pulaski handle. The hardened-aluminum CNC-manufactured male fitting locks into all Dragonslayers™ tool heads. Magnum Pulaski. 3.3 lbs. 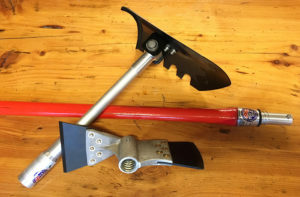 High-carbon replaceable axe and grub-hoe blades; 6-inch wide grub-hoe blade twice the width of traditional Pulaski. Composite tool head snap-locks onto the Universal Handle. Balanced with center of tool mass at handle hole. Pulaski head and Universal Handle same weight as traditional Pulaski but with improved balance. Includes orange blade guards and elastic webbing with two stainless screws to attach an emergency handle if needed on a fire. Blade guard included. Troop Tool. 3.7 lb. Tool is a push-button adjustable angle shovel for scrapping line, digging, throwing dirt and mixing/chinking during mop-up. The tool combines features of the traditional military trenching shovel and the McLeod/Council rake. Composite steel shovel snap-locks onto the Universal Handle. Stows flat for travel and can serve as a safety staff for cross- country travel on steep and uneven ground. Takes the drudgery out of mop-up. Dragon Swatter. 3.2 lb. This is an ergonomically-designed beating tool for all tough turf grassland fires or where root mass or organic matt prevents easy scraping of fire line down to mineral soil. Tony Pad Swatter. 3.0 lbs. This Swatter is designed for Northern forest taiga, Artic tussock and tropical swamp. Works best in non-rocky soil on organic mats that smolder after flames are extinguished. Both Swatter heads snap-lock onto the Universal Handle to create a tool 81-inches in total length.